We supply a full range of replacement office chair gas lifts all of which carry a 2 year guarantee and are BS & SATRA certified. Listed below are the most common gas lifts/cylinders suitable for the majority of office chairs. We can source & supply most other types of gas lifts including cable operated gas lifts, although these have a more complex fitting procedure. Contact our sales team on 01384 - 480030 or via email if you cannot find the type of gas lift you require. Signs that the gas lift is not working/is faulty are gradual sinking, oil seepage from the base of the gas lift and the chair not rising. 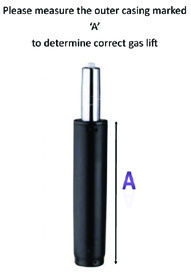 To ascertain which replacement gas lift you require see the image below for measurement instructions. Bear in mind when measuring that the bottom of the gas lift may protrude through the 5-star base. GL14B - Counter/High Chair Gas lift - Black 14"
GL14C - Counter/High Chair Gas lift - Chrome 14"
GL7B - Office Chair Gas lift - Black 7"
GL7C - Office Chair Gas lift - Chrome 7"
GL8B - Office Chair Gas lift - Black 8"
GL9B - Office Chair Gas lift - Black 9"
GL9C - Office Chair Gas lift, Chrome 9"